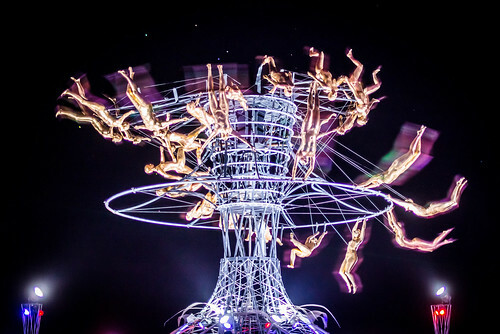 If you've spent much time on the playa, chances are you've seen Peter Hudson's incredible stroboscopic zoetropes. This year's Eternal Return was amazing (can be seen in action here) as one would expect given his track record out there. Here's a video on creating 2011's Charon installation, for instance (my personal favorite). The local Bay Area NBC channel did a piece on Hudzo and his zoetropes recently. "Hudson’s visions are contagious, drawing dozens of volunteers who labor in his warehouse, carrying out the details of his ideas." "Behind the curtain of Hudson’s magic are feats of engineering, science and film arts. His technical trust includes Pixar animators and cutting-edge engineering experts. Still, Hudson fearlessly dips into each aspect of the production with the curiosity of an eternal seeker." Nice little article/video! Definitely adds to the excitement of the upcoming ticket sales for me. Anybody know if he's doing a zoetrope this year? My assumption is he's taking the year off, but would love to be wrong. The Man burns in 244 days!